The JBL T450BT comes fitted with earcups that hold a pair of 32mm drivers. These powerful drivers punch out a sound that is entertaining and bass-heavy, all thanks to the JBL’s PureBass sound. Experience JBL’s signature deep audio with all the punch, while not compromising on the much-needed fun bits. The earcups have been generously padded with soft foam and covered with leatherette. The soft comfortable earcups caress your ears, letting you enjoy your music fatigue-free, even after long hours. The JBL T450BT comes with in-built buttons and a microphone that lets you control all your functions in a jiffy. The microphone lets you answer calls on the go without much hassle, thus, no more do you have to fetch out your phone to take an important call. The JBL T450BT features a body that consists of extremely lightweight materials, thus, making these comfortable to sport, even during long music sessions. The flat folding design lets these snugly fit into your bag allowing easy portability. Go wireless with a Bluetooth connection and ditch those annoying cables. Now you can enjoy the ultimate freedom from hindering wires with the JBL T450BT. Connect to any music device, and let your headphones churn out some heavy punchy audio. 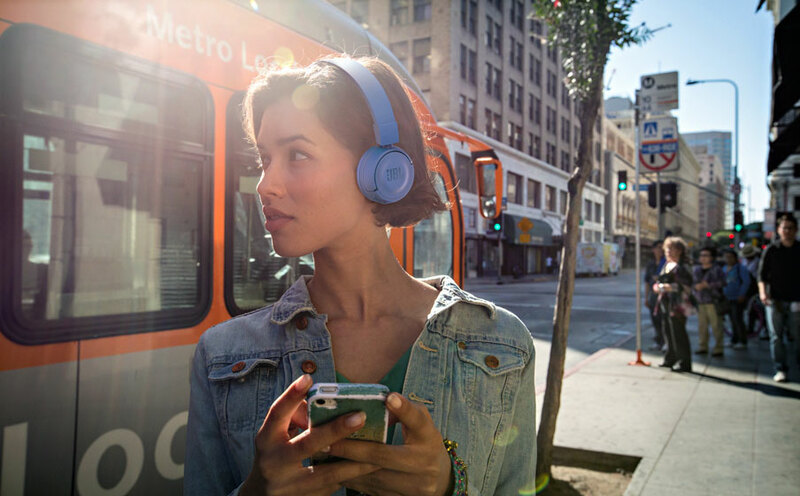 JBL T450BT on-ear wireless headphones bring you JBL Pure Bass sound, up to 11 hours of audio playback, a microphone to manage calls in a design ideal for everyday usage.